Kiwi Nurseries Ltd. can provide small to large caliper tree moving and planting services in the Edmonton area. We are willing to travel anywhere in Alberta. To provide the best chance of a successful transplant, we take every tree move on a case-by-case basis. 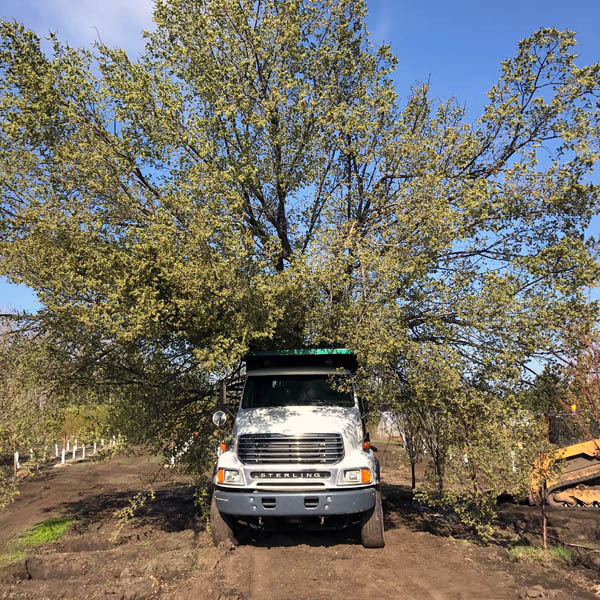 In this assessment we evaluate the tree itself, the site and soil conditions and we can determine the ideal timing for the move, as well as which equipment is most suited to your tree. All tree moving is charged based on the size of equipment at an hourly rate from the time we leave the nursery, to the time we return to the nursery. To obtain a quote on our tree moving services, Contact Us and provide us with as much information about your move as possible. We will need to know the species and approximate size of the tree, site accessibility, address including postal code, and we will need to see photos of the site. These are typically used to dig trees and place them in wire baskets at our nursery, however they can also be used to relocate trees in close proximity to their new home. Spring is here and we are open to the public April 15th!